September 28, 2016 September 25, 2016 / Elizabeth T.
This September, I’ve been trying a variety of skincare products, and today, I’m here to share with you all some of my favorites for the month! So without further ado, let’s get started! 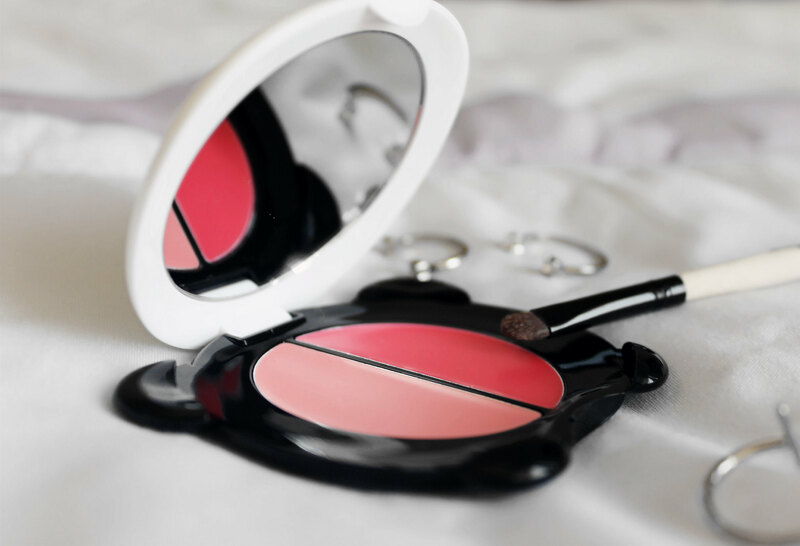 One of my absolute favorites this month has been this adorable little panda lip and cheek palette (because really, with just the packaging alone, this already deserves a favorite spot hahaha)! But jokes aside, with the imminent arrival of fall, this dual lip and cheek palette is perfect for the chillier and drier weather because the cream formula means it’ll help give a healthy glow and pretty lip color without making the skin appear dry, ashy, or flakey. There’s also a red/peach palette, but I liked the pink one a lot more because there’s just something about the autumn and winter months that make me want to play up elements of femininity in my everyday makeup looks 🙂 Would you purchase this just based on the packaging alone? If you’ve been following my blog for awhile now, then you know I’m a huge fan of these Fresh Cherry Tints from Etude House, as seen here and here. I already have both the red and pink versions, and I’ve wanted to try the peach one for so long too, but it’s been out of stock for awhile until recently, so I just couldn’t resist adding it to my collection 🙂 The thing that I love the most about these tints from Etude House are how long lasting they are – even after eating, the color still stays on! 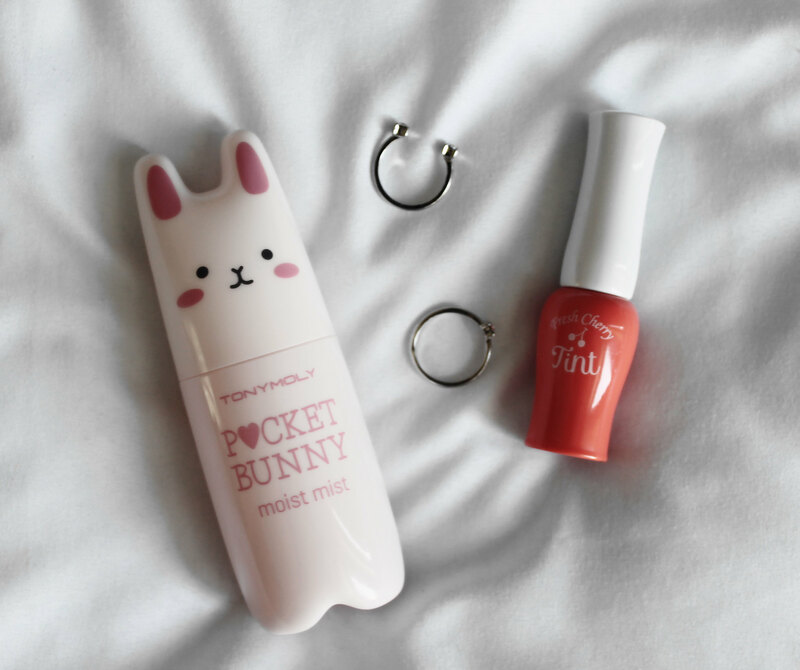 These are some of the most popular and classic Korean lip tints, and if you’re looking to hop on the bandwagon of Korean lip products, you should definitely check these out too! 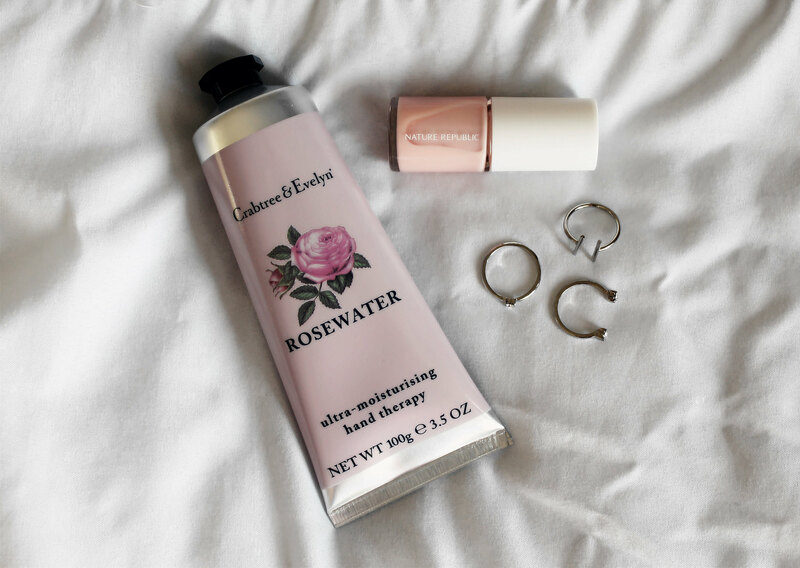 Another skincare favorite of mine has definitely been this moisturizing finishing spray from Tonymoly (and again, can the bottle be any cuter?!)! 😀 Seriously, Tonymoly, I think I’m going to be buying things from you based on packaging alone… Hahaha aside from the adorable little bunny packaging, though, the mist is so much more than just a setting spray because it neutralizes dry spots with a moisture blast, booting elasticity with natural fruit extracts and soothing irritated skin with aloe vera. I also love the light scent because it’s so refreshing, and the mist also adds an instant healthy glow to the skin! I’ve been taking this with me everywhere I go because it also does wonders for when I need to touch up my makeup! Although I may look like a crazy person, spraying this anywhere and everywhere, I really can’t help it (especially when the bunny packaging is so cute) hahaha! 😛 Are you a fan of setting sprays as well? And if so, would you give this one from Tonymoly a try? 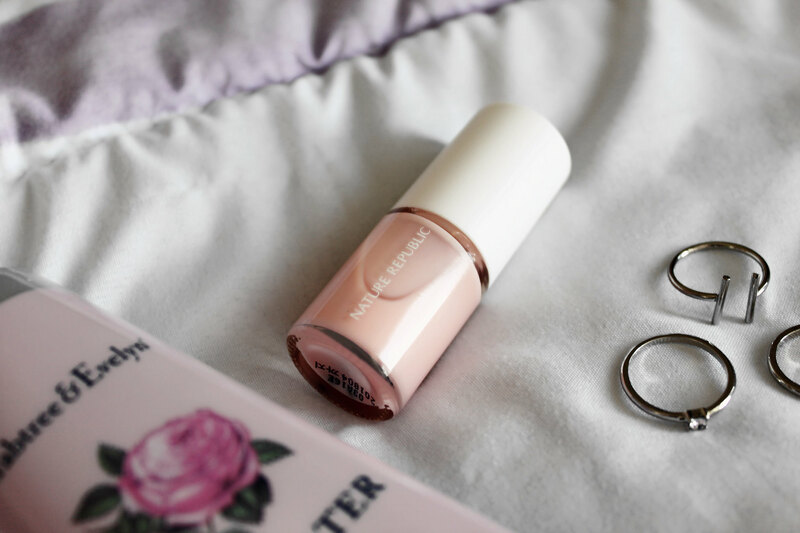 I think I must be really loving pink this month because one of my last beauty favorites is this pretty pale pink nail polish from Nature Republic. As you all probably know from my previous raves about Nature Republic’s nail polishes here, I’m a huge fan of the large variety of colors that they offer. Not only do they have feminine hues that match Asian skin tones really well, I love how watery and fast-drying the formula is, making for a bubble-free and neat manicure every single time! I really like this novel because it’s actually the only novel written by Sylvia Plath, and this story is semi-autobiographical, documenting the protagonist’s descent into clinical depression, which mirrors Plath’s own experiences. It’s a somewhat dark and haunting tale, but I enjoyed this novel since I first read it back in college because the way the author writes about depression and its lingering effects, as well as the feelings of confusion that come with it, are very eye-opening and realistic. Although it’s a pretty short novel and an easy read, the true deeper meaning takes time to decipher and digest. What were some of your favorites for this month? 🙂 Let me know in the comments below! Always love hearing from you! Hope you had a great September as well, and wishing you an amazing October ahead! Love all your faves! You have the cutest packages for skincare products! Thank you so much Jane ❤ 🙂 Hahah the packaging gets me every single time! Love this post! Have you checked out the book Sweetbitter? Its been on everyone’s bookclub list this month. Def something to check out. I’m such a sucker for cute packaging… and these are all adorable! Great picks – thank you for sharing! Thank you so much love ❤ 🙂 Cute packaging gets me every time too! 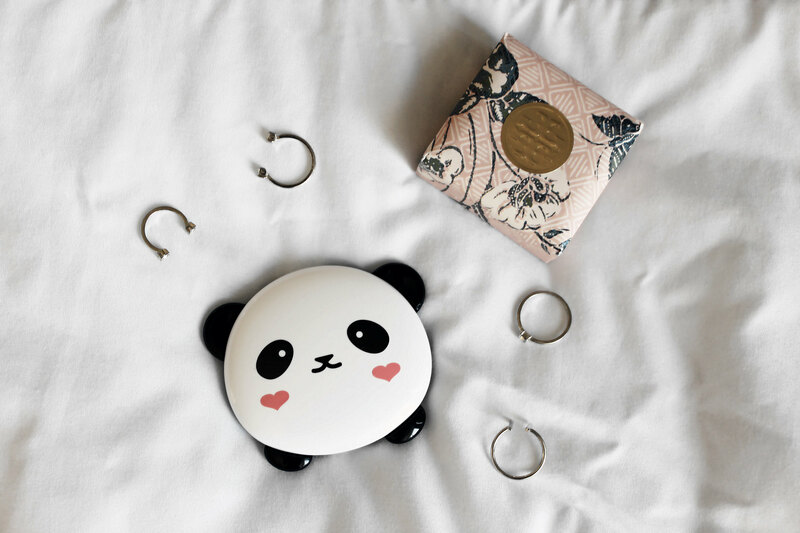 That panda palette is adorable! Thank you so much love ❤ 🙂 It's been my go-to lippie this month! So gorgeous. I love these photos. P.S Would you like to follow each other? Please write about it on my blog! The Innisfree It’s Real Squeeze masks are just my favorite too! I love them so much even though I happen to find the sheet relatively thin, haha. And the line includes so many types, one for every type of skin. I am a big fan of the green tea, tea tree and honey ones (my skin unfortunately breaks out when roses approach)! 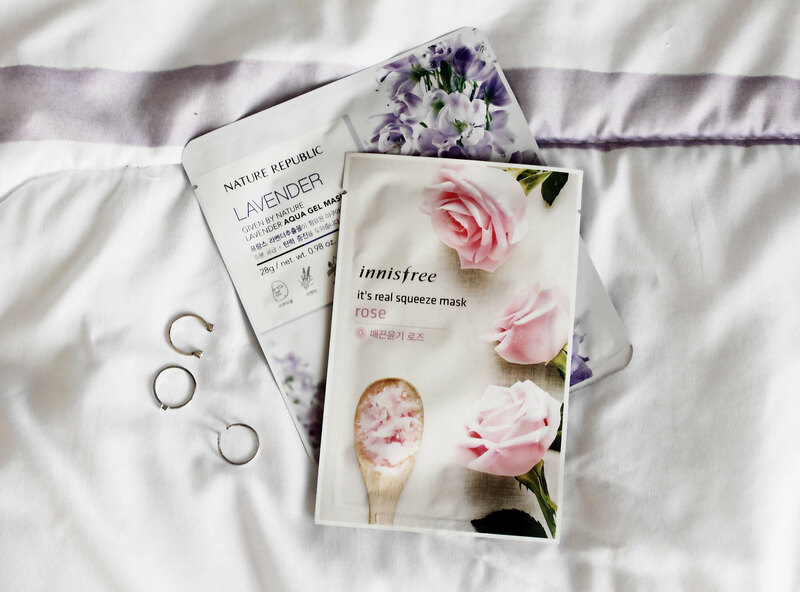 Yes, the Innisfree masks are amazing! 🙂 Thank you so much for stopping by love ❤ 🙂 Glad you enjoyed the post! That lip and cheek palette is so cute! I love the packaging! Thank you so much love ❤ 🙂 It's been one of my favorites this past month! So adorable! 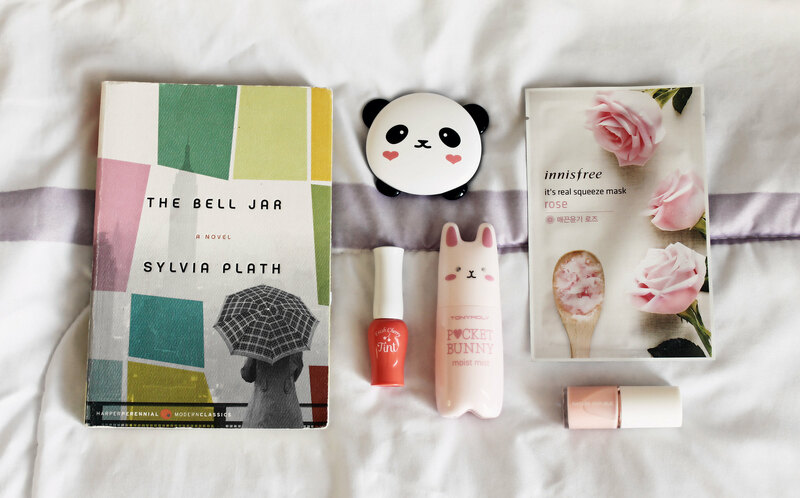 That cute Panda lip and cheek duo is just too sweet & so great to read you’ve been enjoying it a lot. Love that Crabtree & Evelyn hand cream is among your faves as well, lovely. It’s definitely one of my most loved creams as well. 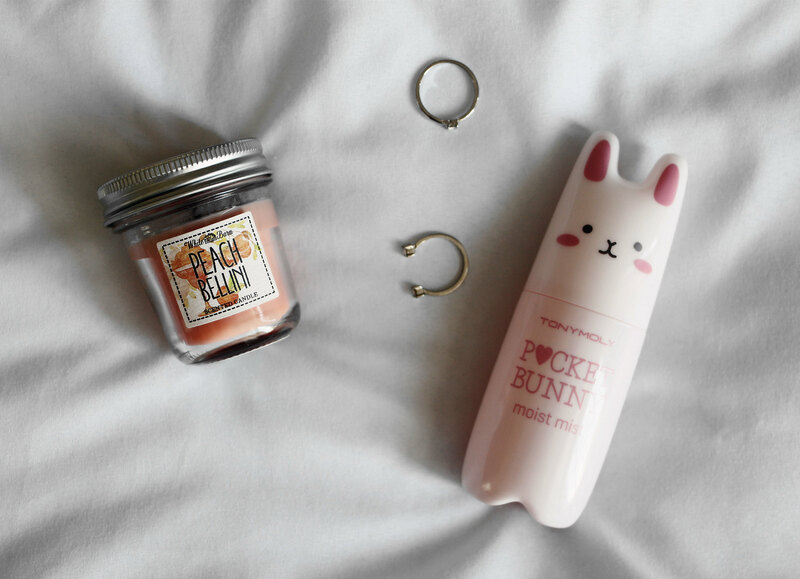 I MUST check out Tonymoly (that bunny mist gives me the heart eyed emoji). 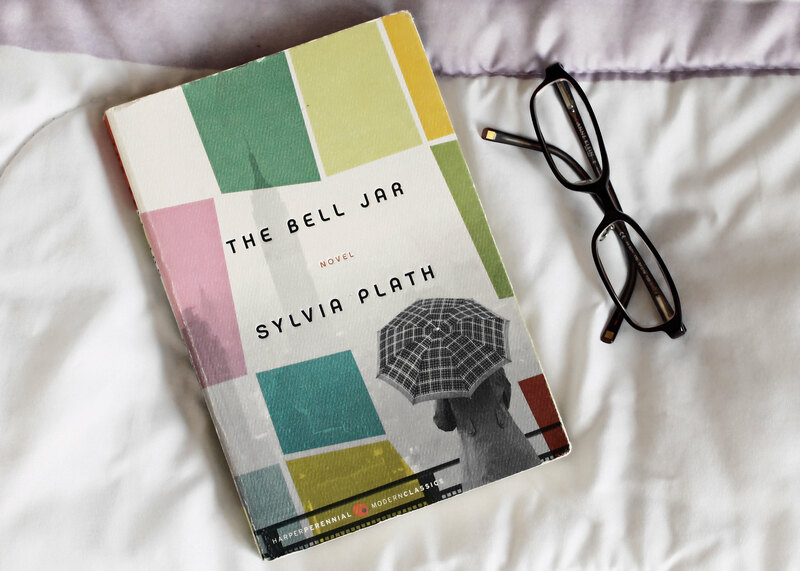 Also, I will look into The Bell Jar. It sounds like a great read despite being a bit dark & sad.